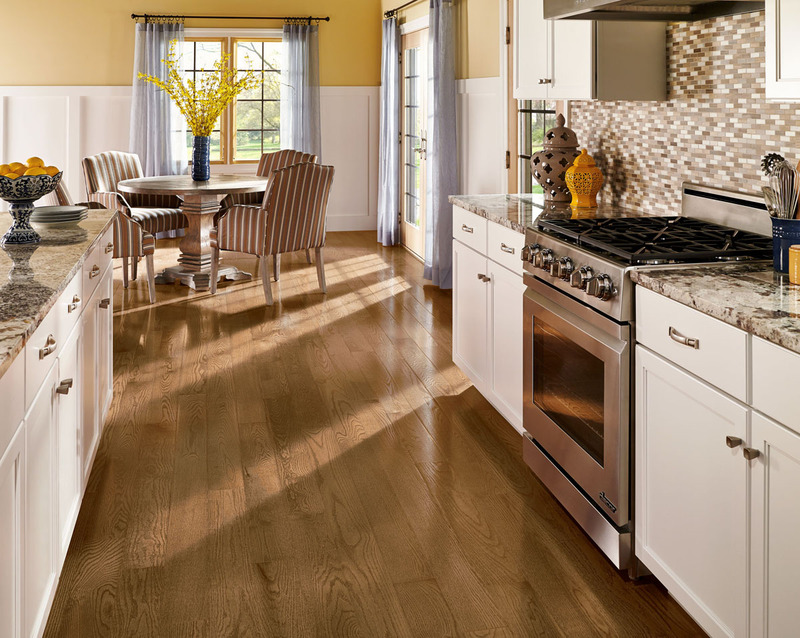 Hardwood is a traditional flooring choice that adds elegance to your home and lends a classy sense of permanence and durability. There is a variety of hardwood flooring on the market today, some solid wood and some engineered, in an assortment of stained finishes, each with its own distinctive characteristics, grain pattern with or without knots. Installing hardwood floors is one of the best investments you can make to enhance your home; not only are they beautiful but they are also easy to maintain. Hardwood floors never go out of style and can stand up to scuffs, scratches, dents, every day wear and tear and still look beautiful. There are different grades of hardwood flooring from which you can choose, affecting the price of the product. The top grade is known as select and better, which includes all the best and longest pieces that come off the production line, followed by select that includes the second best pieces off the line followed by lower grades, such as, number one common and value grade. Another important consideration when you are buying hardwood flooring is the strength or hardness of the wood. This is determined by the hardwood hardness scale that assigns a hardness rating based on a specific species of wood’s resistance to indentation under a controlled force. Floors Direct West, located at 5170 Dixie Rd. in Mississauga, serves an area that includes Streetsville, Cambridge, the Greater Toronto Area, the Golden Horseshoe and surrounding areas. When you visit Floors Direct West, the knowledgeable staff will work with you to choose hardwood flooring to suit your needs from leading suppliers like GRS Hardwood Flooring, Lauzon Preverco Hardwood Flooring, Laurentian Hardwood, Sunca Global Forest Products, Shaws Floors, Coswick Solid Wood Floors, Superior Flooring, Bruce, Satin Finish, BMB, Vintage Prefinished Hardwood Flooring, Armstrong, Quickstyle, Goodfellow and Beaulieu Canada. For more information, visit www.floorsdirectwest.com or call 1-888-307-1542.